I couldn't wait to share this recipe with you. 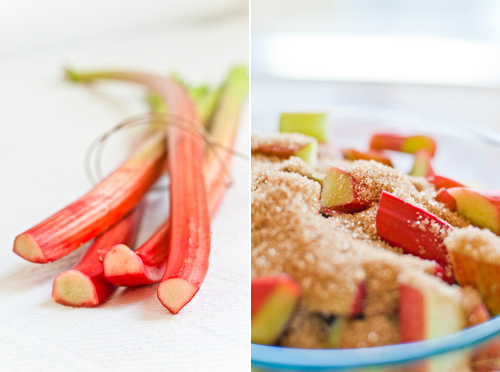 I know, you may think it's just another rhubarb crumble recipe. 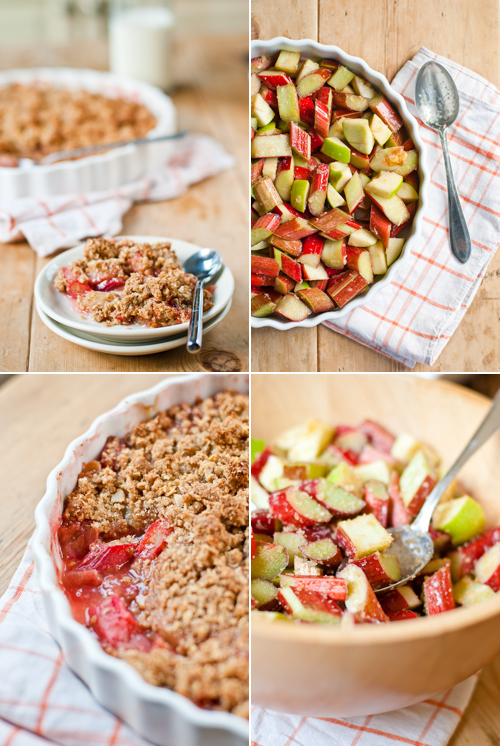 If you look around the food blogosphere, you will probably find hundreds of rhubarb recipes at the moment, rhubarb crumble recipes in particular. It seems that rhubarb is in season all around the world. However, I think there are never enough rhubarb recipes! So I hope you won't mind when I add one more. I have always loved rhubarb, but not as much as my older brother. I think my mum's rhubarb crumb cake was his most favourite dessert ever. Luckily for him, our grandparents used to grow rhubarb in their garden and supplied us with lots of rhubarb most of the summer. It seemed to me that rhubarb was more like a weed, it was harder to kill than grow. So my grandparents had lots and lots of it! What would I give for their rhubarb now! Sigh! I prefer desserts with more fruit and less pastry or dough, and so does P. Then it comes as no surprise that our favourite dessert is crumble. I might actually say that crumble was partially responsible for the birth of this blog, which creates a special relationship between crumble and me. 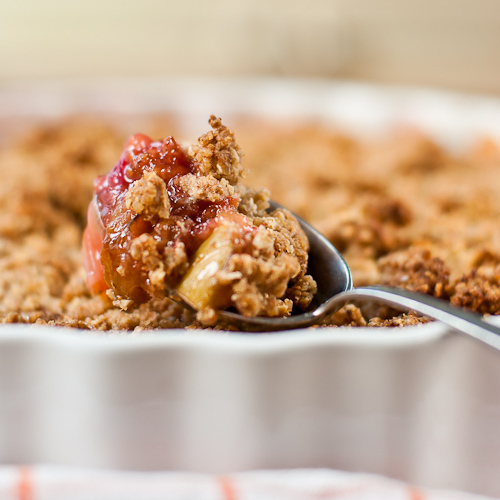 Just check my first blog post, where I posted a recipe for apple crumble, followed by a strawberry crumble recipe less than a week later. 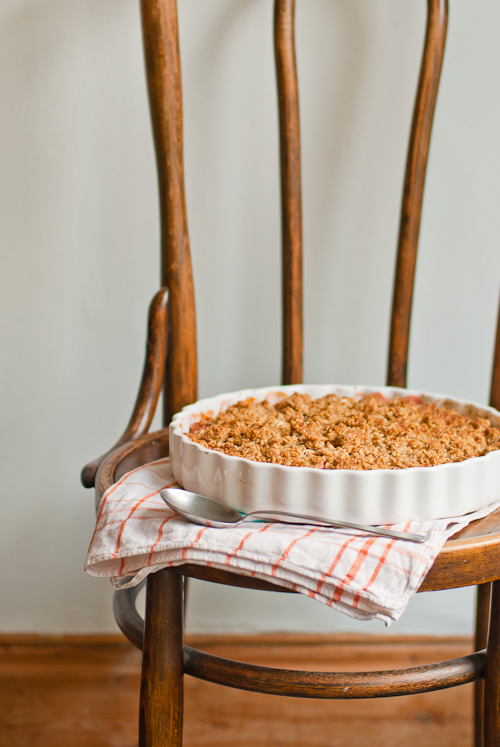 Three crumble recipes aren't too many for one blog, are they? But believe me, this one was the best crumble I have made so far, or at least I thought so while I munched on still warm, freshly baked crunchy crumble. 1. Preheat the oven to 180C and butter a gratin dish. 2. In a medium bowl mix the flour, oats, sugar, salt, black pepper and almonds. Add the butter and rub in with your fingertips until the mixture resembles breadcrumbs. Gather the mixture into a ball and place in the freezer for about 10 minutes. 3. 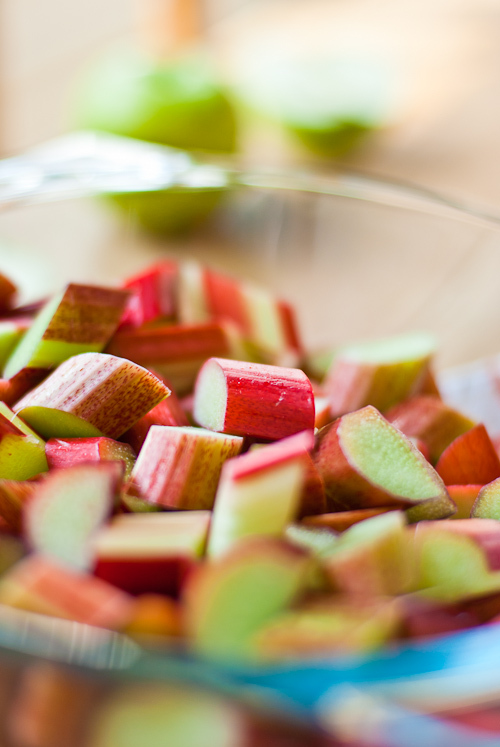 Mix together sugar and cornstarch in a large bowl, add the apples, rhubarb and ginger, and toss until evenly coated. Pour in the rum and toss again. 4. 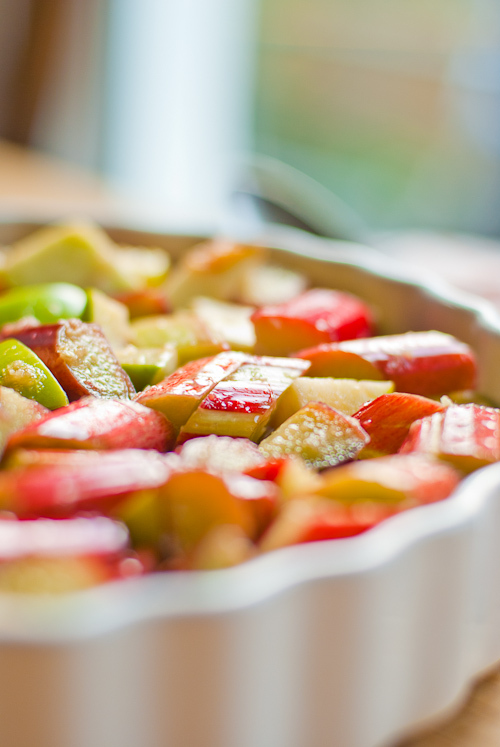 Place the fruit mixture in the prepared gratin dish and sprinkle the crumble filling over the top.